AUSTIN, Texas--(BUSINESS WIRE)--Silicon Labs (NASDAQ: SLAB), a leader in high-performance, analog-intensive, mixed-signal ICs, today announced that Misfit Wearables, a designer and manufacturer of wearable computing products, has chosen Silicon Labs’ EFM32™ Leopard Gecko 32-bit microcontroller (MCU) as the energy-friendly controller for the Misfit Shine™, the world’s most elegant physical activity monitor. The Gecko MCU communicates with the Shine’s 3-axis accelerometer, drives user interface LEDs and hosts a Wicentric Bluetooth® low-energy software stack, enabling connectivity with the Shine App running on Apple iOS devices such as iPhones and iPads – all with the utmost energy efficiency. The Misfit Shine is tapping into today’s burgeoning market for wearable computing devices. According to IMS Research (a part of IHS Electronic Media), sports and fitness monitors, running and cycling computers, and other physical activity trackers will reach 56.2 million unit shipments globally in 2017, up from 43.8 million units in 2013. IMS predicts that a total of 252 million units will ship over the next five years. In a related survey conducted by IMS last year, 62.3 percent of smartphone owners who exercise regularly expressed an interest in mobile health and fitness apps and fitness sensors such as the Misfit Shine that connect to smartphone apps. Like all portable, battery-powered devices, the Shine wearable activity monitor requires extreme energy efficiency to maximize battery life. Instead of using a rechargeable battery, the Shine runs on a single, user-replaceable CR2032 lithium-ion watch battery for four months. Instead of having to recharge the device every few days, the end user simply wears the Shine and monitors his or her fitness activity daily without interruption until it is time to replace the battery. The Misfit design team chose the Leopard Gecko MCU because it provides industry-leading energy efficiency across all energy modes, enabling exceptionally long battery life coupled with optimal processing performance and a high level of integration in a small-footprint package. The Leopard Gecko MCU’s low-energy sensor interface (LESENSE) and peripheral reflex system (PRS) were especially attractive features for Misfit’s ultra-low energy budget. The LESENSE interface autonomously collects and processes sensor data even when the MCU is in deep-sleep mode, enabling the MCU to remain in a low-energy mode for a long time while tracking sensor status and events. The PRS monitors complex system-level events and allows different MCU peripherals to communicate autonomously while keeping the CPU in an energy-saving sleep mode as long as possible to reduce overall system power consumption. Simplicity Studio is a comprehensive graphical development environment for EFM32 Gecko MCU applications. Available at no charge, Simplicity Studio provides developers with one-click access to all the information, documentation, energyAware tools, and software and source code libraries needed to quickly develop energy-friendly applications. Key elements of Simplicity Studio include the energyAware Profiler, an easy-to-use debugging tool for low-energy embedded system development, and the energyAware Designer, a tool that eases the time-consuming task of debugging I/O pin conflicts. Misfit Shine is an elegant physical activity monitor that you can wear anywhere on your body and to any occasion. Set your personal activity goals on the Shine app and then wear Shine anywhere on your body: hip, neck, wrist, shoes, chest, shirt, etc. Tap Shine and a halo of lights appears through the metal shell to show your progress toward your daily goal. It is super-strong and is water resistant to 50 meters so it is great for swimming. It is carved out of a solid block of aircraft-grade aluminum and is built to last a lifetime. To sync the device to your smartphone, simply place Shine on the screen of your mobile device, and the data is transferred in seconds. Powered by a regular coin-cell battery which the user can easily replace by themselves, Shine lasts for four months – no cables for syncing or charging ever. For more information: www.misfitwearables.com/shine. The EFM32 Leopard Gecko MCU family, part of the world’s most energy-friendly MCU portfolio, features an ARM® Cortex®-M3 processor, up to 256 kB of flash memory, optional USB connectivity, a direct-drive TFT, CPU speeds up to 48 MHz, and the same autonomous, low-energy peripherals found in the original Gecko family including AES encryption, a pulse counter, low-energy UARTs, the LESENSE interface and on-chip operational amplifiers. EFM32 Gecko MCUs are designed to achieve the lowest system energy consumption for a wide range of Internet of Things, green energy and portable battery-powered applications. Misfit is focused on developing great wearable products: things that a lot of people would wear all the time for a long time. A pioneer in the emerging world of wearable products, the company is making products and services in the consumer health and fitness space to inspire people to be more active and develop healthy habits. Misfit’s first product is the award-winning Shine, an elegant physical activity tracker that you can instantly sync with your smartphone just by placing the device on the screen. Misfit was founded in 2011 by Sonny Vu with John Sculley, the former CEO of Apple and Pepsi, and Sridhar Iyengar, co-founder and CTO of AgaMatrix, and have Founders Fund and Khosla Ventures as lead investors. Other investors include Norwest, OATV, Max Levchin, and incTANK. Note to editors: Silicon Laboratories Inc., Silicon Laboratories, Silicon Labs, SiLabs and the Silicon Labs logo, EFM, EFM32, EFR, Energy Micro, Energy Micro logo and combinations thereof, and “the world’s most energy friendly microcontrollers” are trademarks or registered trademarks of Silicon Laboratories Inc. ARM, Cortex-M0/M0+/M3/M4 and Keil are trademarks or registered trademarks of ARM Limited. All other product names noted herein may be trademarks of their respective holders. Follow Silicon Labs on Twitter at http://twitter.com/silabs and on Facebook at http://www.facebook.com/siliconlabs. 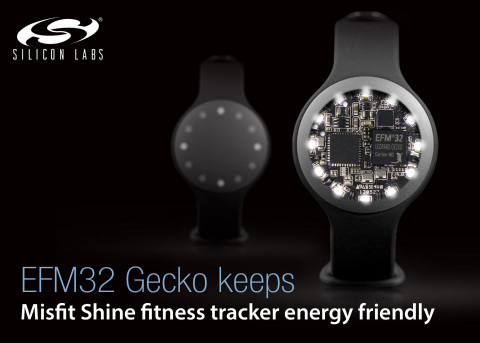 Misfit Wearables, a designer and manufacturer of wearable computing products, has chosen Silicon Labs’ EFM32 Gecko MCU as the energy-friendly controller for the Misfit Shine fitness tracker.